As experienced patio, carport & home builders, we receive a lot of questions in regards to maintaining patios, carports & house roofs. 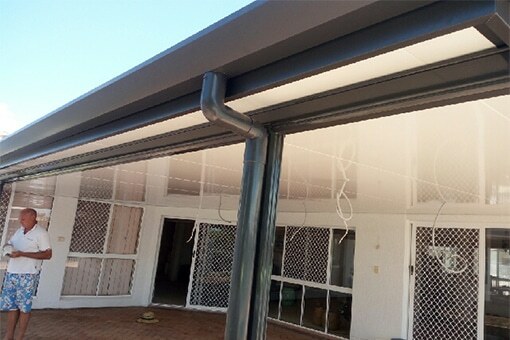 Keeping your gutters free from leaves etc. can prevent them from overflowing and having water leak back into your ceiling easily. In semi-rural or bushland areas, leaf litter can also be a fire hazard. Clean gutters can save you a lot of worry and money in the long run. If you are noticing your gutters overflowing and excess amounts of water are making their way into your house or beneath your patio or carport. It might be a good time to scale a ladder and take a look for yourself and see how clogged your gutters are. 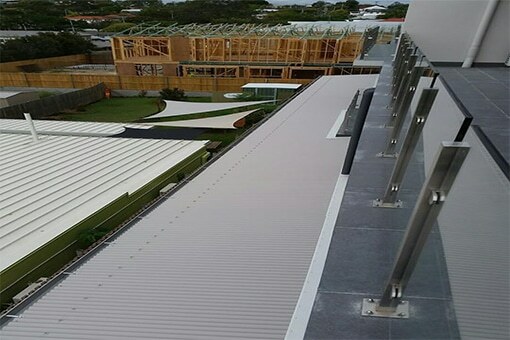 Gutters can get obstructed with all types of vegetation matter along with the odd tennis ball & toys. Cleaning your gutters is a simple job and can help prevent further maintenance down the track including blocked down pipes and drains. Before you decide to climb your ladder, you must be conscious of what is around you for example a power lines. Make sure you wear good strong shoes, not thongs or slip-ons. Another optional extra is a device called a ‘Ladders Little Helper’ which holds your ladder steady, and stops you ladder from scratching the gutter. Alternatively, you can wrap an old towel on the ladder where it meets your gutter. Use a small tidy brush to move debris along so you can collect & dispose of the leaves. Once the large matter has been removed, you can use your hose to flush away what is left down your nearest down pipe or wait for the next decent rain. You will find with regular maintenance fewer problems will arise with blocked gutters, down pipes and drains.